Baseball comes back today! The Detroit Tigers' home opener will be at 1:05 p.m. against the Boston Red Sox. I'm so excited! Of course, I have to be at work this afternoon... sigh. But it's the principle of the matter! Opening Day, for me, is usually when the New York Yankees play their first game of the season; they're not playing the Tampa Bay Rays 'til tomorrow, though. But I've lived in Michigan for more than 30 years now, after moving from New York ... there can be a bit of wiggle room. It is simply required to eat a hot dog in honor of this occasion — what's a baseball game without a hot dog, after all? 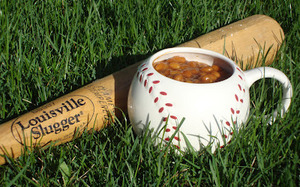 And I'm offering the perfect accompaniment, since the Tigers are playing the Red Sox from Beantown: Boston-Style Baked Beans, featuring the rich sweetness of molasses. Now, I know that there are folks who don't share my excitement today, who aren't serving ritual, traditional foods. Many people think that baseball is boring, because they don't understand it. I'll spare you my rants about other sports which I simply cannot endure or which I ridicule with great glee, and rather focus on what I consider to be the great joy of baseball. Sure, I'll grant you that there are lots of foul balls, causing significant delays in the games. Sure, there are plenty of superstitious players going through repetitive rituals, making it tedious to watch sometimes. Sure, baseball players are prisses who can't play in bad weather. Sure, there are performance-enhancing drugs and other scandals. But baseball can be watched intently, play by play, or it can be company in the background; it can be whatever you need it to be. There are thrilling moments that people remember — and debate — for decades. People have been so devoted to the sport that their hearts have been broken by teams that have abandoned cities and by players who have abandoned teams. Most importantly, though, the true beauty of baseball is this: with every single pitch there is the potential for something magical. It doesn't always happen. But the chance is there, and the hope is there. And every so often, you get to witness a spectacular moment. Today, a Mom or Dad or maybe a Grandpa is taking a child to his or her first baseball game. They're wandering through the stadium, buying peanuts and Cracker Jacks and a souvenir program. They're looking for their section. They're heading toward the usher. They're about to climb to their seats. And in an instant, they walk out from the dark corridor and into the blinding sunshine. A field of the brightest, most vibrant green lies before them. Players are casually tossing the ball around. Vendors are calling out with offers of pretzels and ice cold beer. The scoreboard is zeroed out, waiting for the first hit, the first ball, the first run. There are so few moments as special as that one instant when you walk into the ball park and the excitement surrounds you and transports you! It elicits a gasp, and brings both a smile and a tear. Place all ingredients into a small saucepan; bring just to a boil, then lower heat to "low" and cook for 10 minutes, stirring occasionally.